The weather in Boston is getting warmer. If you are in the market for a new grill this summer chances are you are going to do some online research before making a purchase. Weber is a very popular brand name in grills. They have been around for a long time and make a solid affordable-luxury product. KitchenAid is also a well-known appliance brand. Recently you may have noticed the KitchenAid name recently pop up on grills. We will look at features, prices and compare both grills. Weber grills have been around since 1952. They originated in Chicago, IL where George Stephen Sr. created a grill out of a marine buoy. In 1971 Weber introduced the first gas grill. Gas grills gained popularity because they were able to heat up more quickly than charcoal. 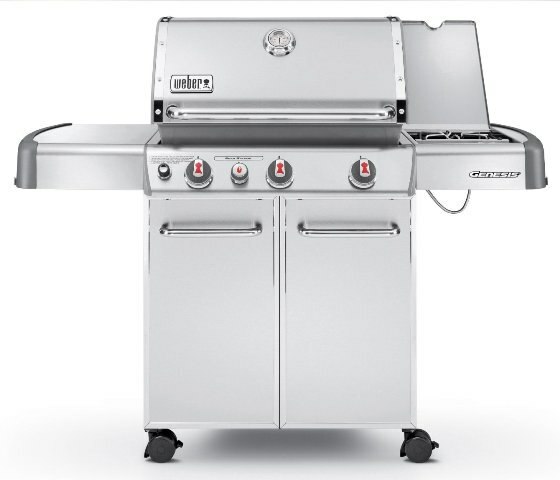 Over the years Weber gained a reputation as being a solid, reliable brand at a reasonable price. Today Weber manufactures three levels of gas grills: Spirit, Genesis, and Summit. The Genesis series is a very popular choice among grill buyers. Genesis grills are 60’’ wide (with both side-shelves raised) and are available in a variety of colors (stainless, black, red, green, copper, grey etc). Side burner on 330 models keeps your cooking in one place, giving you the opportunity to boil water (for corn/lobster etc) while you are cooking on your grill. KitchenAid is a popular appliance brand owned by the Whirlpool Corporation. KitchenAid produces their own major appliances, however they do not make their own grills. 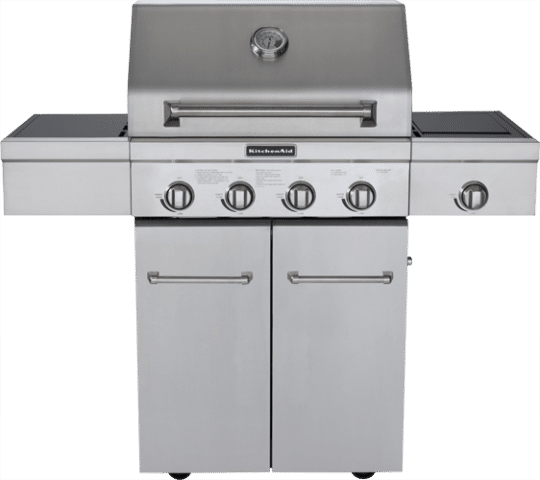 KitchenAid grills are manufactured by Nexgrill, a company who produces grills for Lowe’s, Sam’s Club, Home Depot, Costco Wholesale, Sears, BJ’s Wholesale, Wal-Mart, and Pricemart. Side burner keeps your cooking in one place, giving you the opportunity to boil water (for corn/lobster etc) while you are cooking on your grill. Looking at specs alone, both grills appear to be similar. They have the exact same specs for BTU's at 60,000 and the same limited warranty at 10 years. However, they are totally different grills. KitchenAid is manufactured in China whereas Weber is produced in the US. I am not China bashing here or saying buy American that is at a much higher price. However, they do both have the same gauge of metal, but there is more of it on a Weber. The weight of a KitchenAid is 100 pounds. Weber weighs 165 pounds as most of the components are also stainless steel. Weber is the least repaired product sold at Yale (even less than Miele) at less than 2% service within the first year. After the winter of 2014/2015, I do think quality matters. KitchenAid is the better price, but Weber is the better grill. 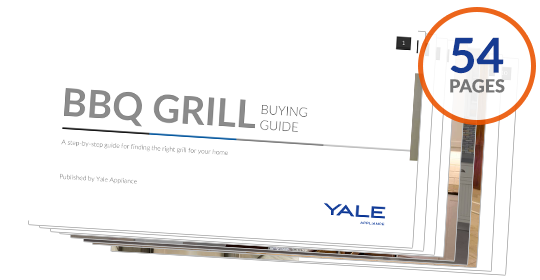 Get the Yale BBQ Grill Buying Guide with features, specs and inside tips to all the brands like Kalamazoo, DCS, Lynx, Weber, Napoleon, Alfresco, Wolf and more. Well over 100,000 people have read a Yale Guide. (Editors Note: Weber Genesis and Summit grills are made in the US. Their Spirit series is produced in China).